Wonder where your weight is coming from? Are you paying attention when you eat? Eating, like any other important task you do throughout your day requires conscious attention. 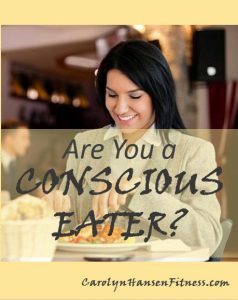 Conscious eating is habit you need to adopt. Seems logical and something we do automatically, but you’d be surprised at how many people “eat on the run”…literally eating while they are moving. When you consume foods while standing or moving, most likely you won’t be paying attention to how much you are consuming. The calories you’ve consumed won’t be registered or fill you up like they should. Make a concentrated effort to be seated whenever you eat a meal or snack. This helps you to focus on the foods you are consuming. Distractions are well, just that – a distraction from what you should be paying attention to. In regards to meals, too many people engage in unhealthy eating habits like sitting in front of the TV while they eat, or browsing the Internet while at work as they quickly…without conscious attention, down their lunch. The moment you focus on anything but the food you are eating is the minute that you reduce the psychologically satiety that comes with eating. Get into the habit of focusing on eating when eating! Sit at the table and consciously enjoy your food…every bite. Put your attention on your food not on a book, cell phone or TV. Putting your fork down between bites helps to ensure you are not rushing through your meal and potentially consuming more food than you would otherwise. It takes a while before your body registers that you are full, so give yourself a chance to get those signals by slowing down. Putting your fork down between bites helps you to do just that. Make a conscious effort when you sit to stop and notice the taste and texture of the foods you are consuming. Do this first thing when you begin so that it sets the tone for the entire meal. The idea is to help make you feel satisfied so that you stop eating when you are full. Those that consume foods without noticing the texture and taste, typically end up going back for seconds even if they are not really hungry. Psychological satisfaction is a very real thing and you must strive to satisfy that along with physical hunger to really see optimal health and weight control. Rating your hunger before eating will help you to see if you are in the habit of eating despite not actually being hungry so that you can make adjustments. Only when you hunger levels reach 7 or 8 on a scale of 1-10 should you be reaching for food. If you begin before that, you’ll be consuming too many calories and open the door to weight gain. As you eat, you should be keeping tabs on your hunger. Once you are 80% full, put your fork down and push away from the table. Because it takes time for your brain to register “full,” if you keep eating beyond this point, you’re in danger of reaching 100% full and you’ll end up by the price later in terms of weight gain and how you feel. By stopping at 80% after digestion finishes up, you will be satisfied and saved yourself from becoming over-stuffed with too much caloric intake. Once you have your nutrition and eating habits in check, the next thing to focus on is building great activity habits that ensure you stay fit, active, and healthy. All my products support a whole body approach that supports both the body and the mind. If you are serious about achieving a truly healthy lifestyle, one of youth and vitality – “Reclaim Your Longevity“ was created for you.